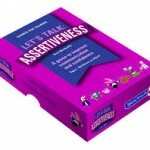 Pure assertiveness – dominance for the sake of being dominant – is not a natural behaviour for most people – the fact is that most people simply are not naturally assertive. The assertive behaviour of highly dominant people tends to be driven by their personality (and often some insecurity). It is not something that has been ‘trained’. 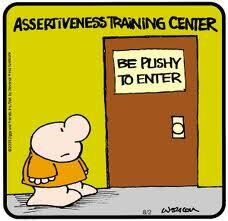 For anyone seeking to increase their own assertiveness it is helpful to understand the typical personality and motivation of excessively dominant people, who incidentally cause the most worry to non-assertive people. It’s helpful also at this point to explain the difference between leadership with dominance: Good leadership is inclusive, developmental, and a force for what is right. 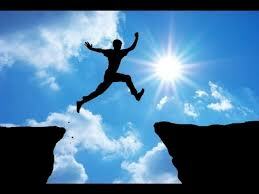 Good leadership does not ‘dominate’ non-assertive people; it includes them and involves them. Dominance as a management style is not good in any circumstances. It is based on short-term rewards and results, mostly for the benefit of the dominant, and it fails completely to make effective use of team-member’s abilities and potential. The fact is that most excessively dominant people are usually bullies. Bullies are deep-down very insecure people. They dominate because they are too insecure to allow other people to have responsibility and influence, and this behaviour is generally conditioned from childhood for one reason or another. The dominant bullying behaviour is effectively reinforced by the response given by ‘secure’ and ‘non-assertive’ people to bullying. The bully gets his or her own way. The bullying dominant behaviour is rewarded, and so it persists. Dominant, bullying people, usually from a very young age, become positively conditioned to bullying behaviour, because in their own terms it works. Their own terms are generally concerned with satisfying their ego and selfish drives to get their own way, to control, to achieve status (often implanted by insecure ambitious parents), to manipulate, make decisions, build empires, to collect material signs of achievement, monetary wealth, and particularly to establish protective mechanisms, such as ‘yes-men’ followers (‘body-guards’), immunity from challenge and interference, scrutiny, judgement, etc. Early childhood experiences play an important part in creating bullies. Bullies are victims as well as aggressors. And although it’s a tough ask for anyone on the receiving end of their behaviour they actually deserve sympathy. Non-assertive people do not normally actually aspire to being excessively dominant people and they certainly don’t normally want to become bullies. When most people talk about wanting to be more assertive, what they really mean is ‘I’d like to be more able to resist the pressure and dominance of excessively dominant people.’ Doing this is not really so hard and using the simple techniques above it can even be quite enjoyable and fulfilling. Importantly, the non-assertive person should understand where they really are – a true starting point: non-assertive behaviour is a sign of strength usually, not weakness, and often it is the most appropriate behaviour for most situations – don’t be fooled into thinking that you always have to be more assertive. 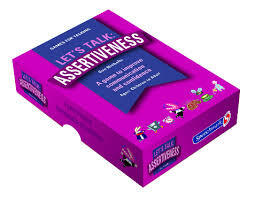 Understand where you want to be: what level of assertiveness do you want? Probably to defend yourself, and to control your own choices and destiny (which are relatively easy using the techniques below), not to control others. For people who are not naturally assertive, it is possible to achieve a perfectly suitable level of assertiveness through certain simple methods and techniques, rather than trying to adopt a generally more assertive personal style (which could be counter-productive and stressful, because it would not be natural). People seeking to be more assertive can dramatically increase their effective influence and strength by using just one or two of these four behaviours prior to, or when confronted by a more dominant character or influence, or prior to and when dealing with a situation in which they would like to exert more control. Here are some simple techniques and methods for developing self-confidence and more assertive behaviour. Know your facts and have them to hand. Anticipate other people’s behaviour and prepare your responses. Re-condition and practice your own new reactions to aggression (display positive writings where you will read them often – it’s a proven successful technique). 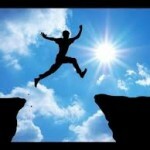 Have faith that your own abilities and style will ultimately work if you let them. Feel sympathy for bullies – they actually need it. Ensure you know all the facts in advance – do some research, and have it on hand ready to produce (and give out copies if necessary). Bullies usually fail to prepare their facts; they dominate through bluster, force and reputation. If you know and can produce facts to support or defend your position it is unlikely that the aggressor will have anything prepared in response. When you know that a situation is going to arise, over which you’d like to have some influence, prepare your facts, do your research, do the sums, get the facts and figures, solicit opinion and views, be able to quote sources; then you will be able to make a firm case, and also dramatically improve your reputation for being someone who is organised and firm. Anticipate other people’s behaviour and prepare your own responses. Role-play in your mind how things are likely to happen. 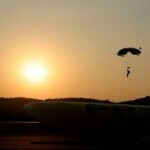 Prepare your responses according to the different scenarios that you think could unfold. Prepare other people to support and defend you. 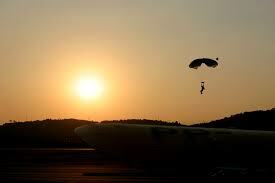 Being well prepared will increase your self-confidence and enable you to be assertive about what’s important to you. And don’t be fobbed off. Stick to your guns. If the question is avoided or ignored return to it, or re-phrase it (which you can prepare as well). Re-conditioning your own reaction to dominant people, particularly building your own ‘triggered reactions’, giving yourself ‘thinking time’ to prevent yourself being bulldozed, and ‘making like a brick wall’ in the face of someone else’s attempt to dominate you without justification. Try visualising yourself behaving in a firmer manner, saying firmer things, asking firm clear, probing questions, and presenting well-prepared facts and evidence. Practice in your mind saying ‘Hold on a minute – I need to consider what you have just said.’ Also practice saying ‘I’m not sure about that. It’s too important to make a snap decision now.’ Also ‘I can’t agree to that at such short notice. Tell me when you really need to know, and I’ll get back to you.’ There are other ways to help resist bulldozing and bullying. Practice and condition new reactions in yourself to resist, rather than cave in, for fear that someone might shout at you or have a tantrum. If you are worried about your response to being shouted at then practice being shouted at until you realise it really doesn’t hurt – it just makes the person doing the shouting look daft. Practice with your most scary friend shouting right in your face for you to ‘do as you are told’, time after time, and in between each time say calmly (and believe it because it’s true) ‘You don’t frighten me.’ Practice it until you can control your response to being shouted at. Non-assertive people have different styles and methods compared to dominant, aggressive people and bullies. Non-assertive people are often extremely strong in areas of process, detail, dependability, reliability, finishing things (that others have started), checking, monitoring, communicating, interpreting and understanding, and working cooperatively with others. These capabilities all have the potential to undo a bully who has no proper justification. Find out what your strengths and style are and use them to defend and support your position. The biggest tantrum is no match for a well organised defence. Re-discover the belief that non-assertive behaviour is actually okay – it’s the bullies who are the ones with the problems. Feeling sympathy for someone who threatens you will psychologically put you in the ascendancy. Aggressors are often grown from children who were not loved, or from children who were forced to live out the aspirations of their parents. Be kind to them. In many ways they are still children.